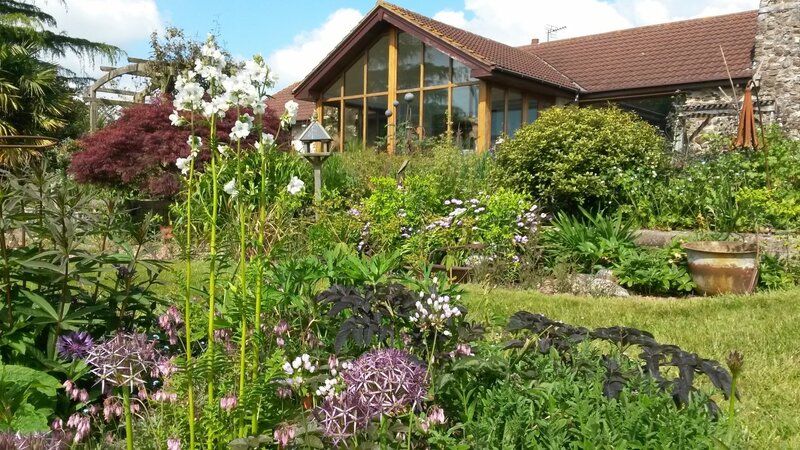 Country garden of 1½ acres, packed with different and unusual herbaceous perennials, trees, shrubs and bamboos. Designed for yr-round interest, wildlife and owners' pleasure. Naturalistic planting in colour coordinated mixed borders, highlighted by metal sculptures, provides a backdrop to the view. 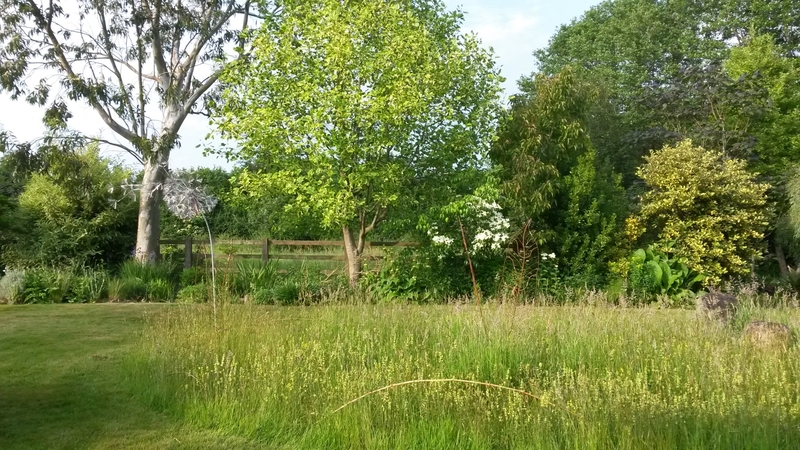 Natural stream, pond and damp woodland area, mini wildlife meadows and raised gravel/alpine garden. The major part of the garden was started in 2000 in the paddock in front of the bungalow. The damp ‘Alder Grove’ area at the bottom left was added in 2005, with planting starting in spring 2007. 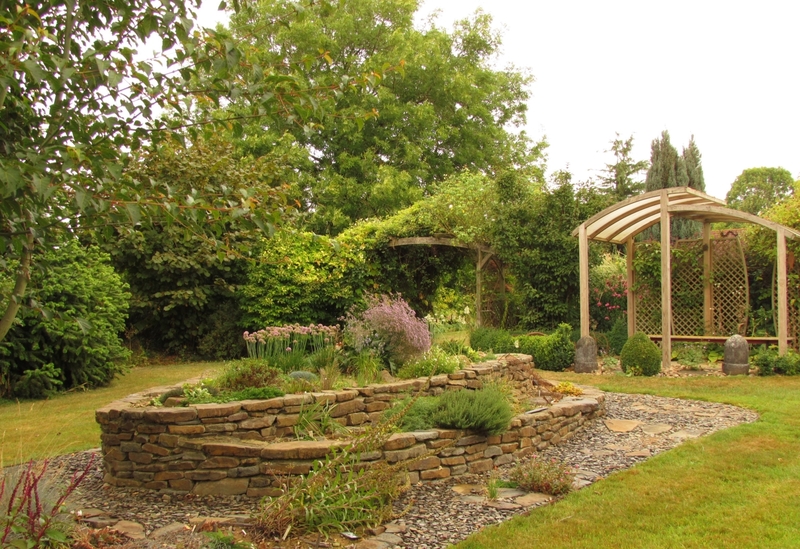 The three large centre island beds were created in 2008 and 09 respectively, and the lower border planted with perennials in 2011, as there were problems with couch infestation. The ‘Stump Border’ started in 2012 above the woodland is filling out, and a new area below the 'Bus Stop' is under development as a raised sand bed and rock/crevice garden for alpines. 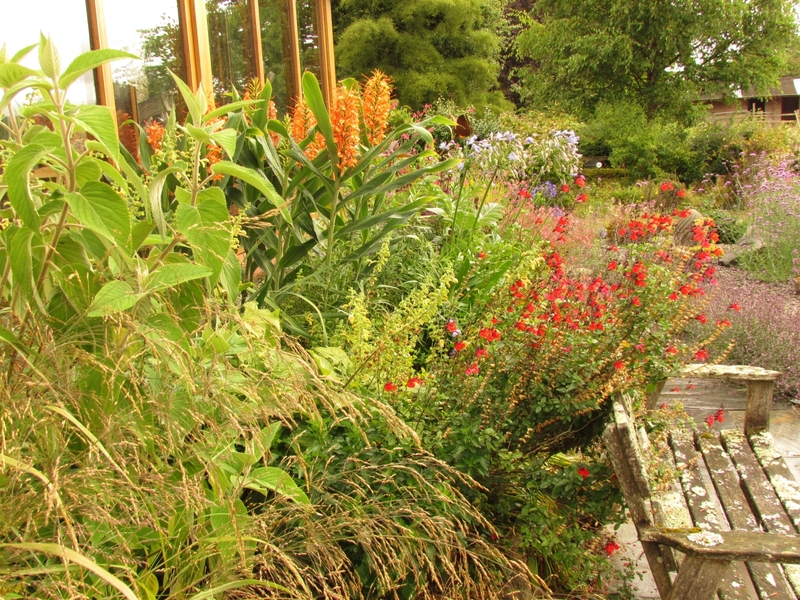 My aim is create a wildlife haven without compromising our own requirements from the garden. Leaf colour, form, scent and texture in plants are just as important to me as flowers; I love purple foliage, and cannot resist some of the tactile grasses. I believe all senses need to be engaged in the enjoyment of a good garden. 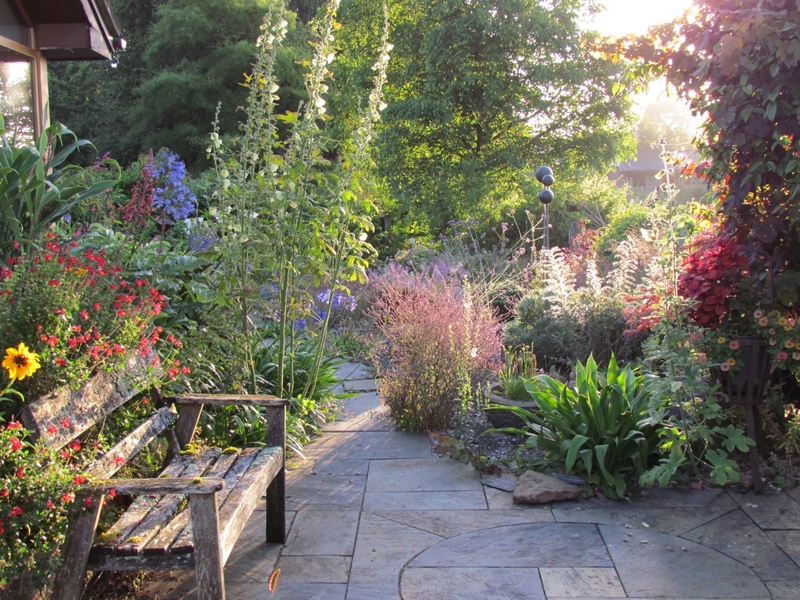 Densely stocked borders, a shady arbour and sweeping lawns culminate at a group of three granite rollers leading the eye down the gently sloping garden towards the view of East Hill and the River Otter. 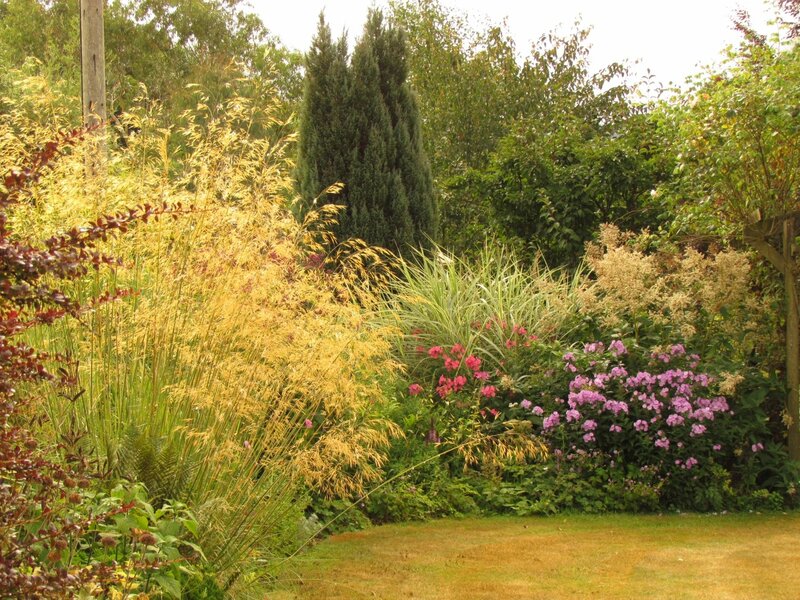 Designed for year round interest, amongst a framework of trees, shrubs and bamboo, the mixed borders are colour themed along their length, ranging from soft pinks, purples and whites through zingy hot reds and yellows and returning to more modest hues. Leaf colour, form and texture are as important as flowers in the interesting and unusual plants I love to source, conserving them for the future. A natural stream rising only 3 fields away flows along the bottom of the garden, feeding my favourite shady, damp area (Alder Grove) which is home to a growing collection of arisaema, podophyllum, primulas, roscoea and trillium. Purple leaved shrubs and trees link garden areas, including cercis Forest Pansy, physocarpus Diablo grown from hardwood cuttings and malus RJ Fulcher which I grafted myself. 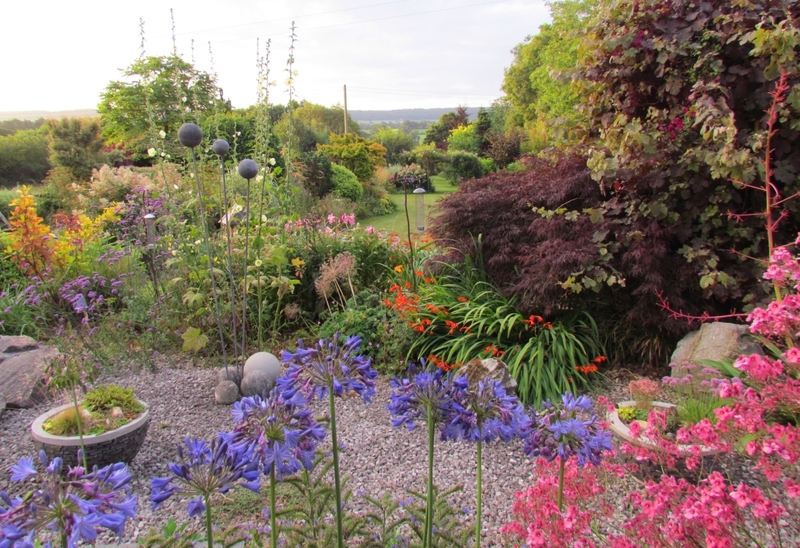 Borders are sometimes mulched with manure on a rotational basis, when I can get to it! Bird's foot trefoil, wild carrot, orchids and yellow rattle grow in areas left as mini wild meadows, attracting bees and butterflies, as well as the many cultivated flower nectar bars. Gold and greenfinches plunder the seeds of knautia macedonica, teasel and verbena. Quirky iron sculptures lurk around the garden, bulrushes by the stream, a bumble bee and a firework in the border, with wind spinners, natural oak stumps and branches from around the farm adding solidity to the visual display. The terrace area near the house holds smaller and more temperamental treasures requiring protection from the perils of our frost pocket. Here salvias and hedychiums grow around the garden room, with smaller alpines in the concrete rings and rockery. 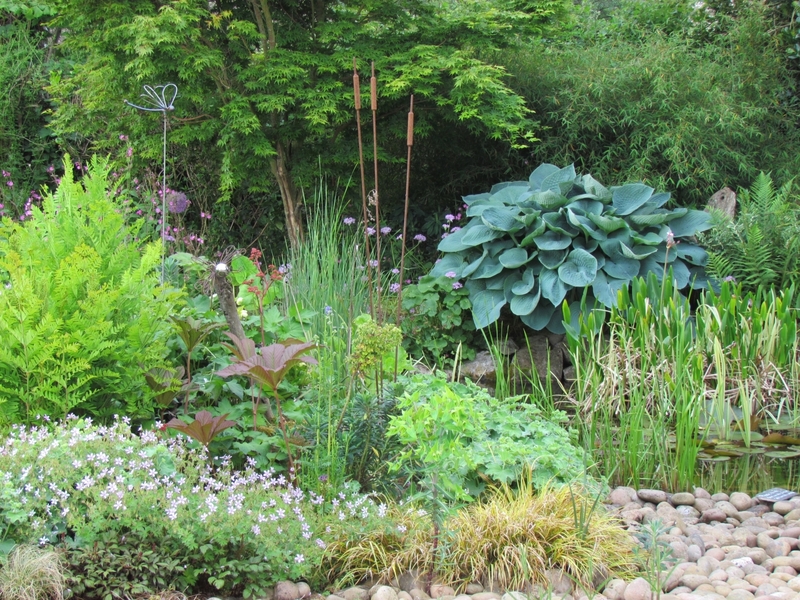 A raised alpine bed provides further space for smaller treasures. I always tell my visitors to look closely, or they might miss something really special! 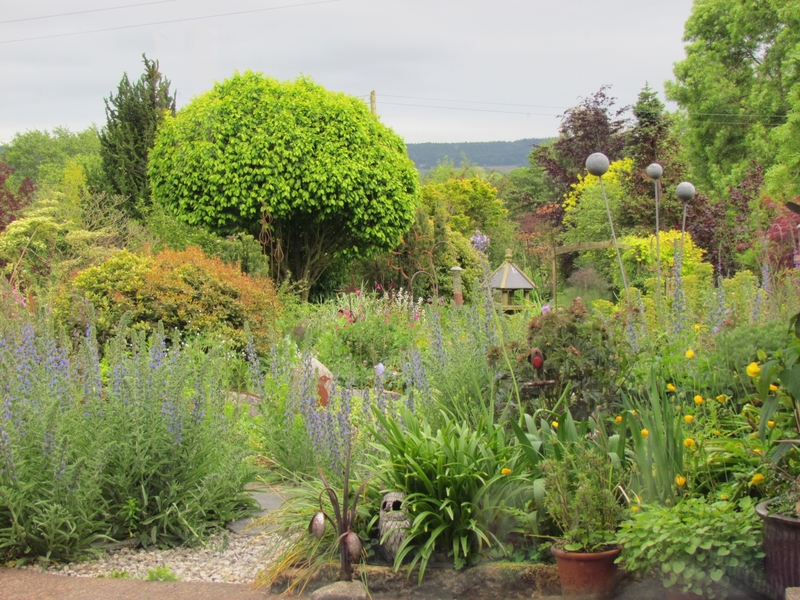 Leave A30 at Iron Bridge from Honiton 1m, Patteson's Cross from Exeter ½m and follow NGS signs.